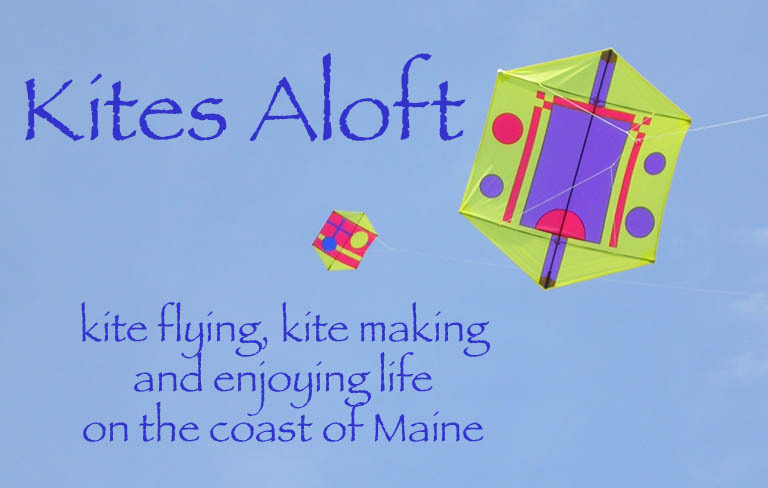 Tony Otis and I held a kite making workshop on Jan 10 in Tony O's kite workroom. This was the first time Tony O taught a workshop (I ran a fighter kite workshop a few years ago) but he is a fine kite maker and a very patient teacher. The sewing experience of our participants ranged from well experienced to first time on a sewing machine. But they were all new to kite making, only two had even made one kite before. We furnished the kite makers with the material to make two complete diamond kites, including applique material and a template to make more of the same sized kite. They all hemmed their kite sail and attached the pockets in the morning and after a lunch break I demonstrated an applique process, drawing a design, tacking the fabrics onto the kite sail, sewing the design and completing it by cutting out the extra fabric. Then they all got to try the same. A great job was done by all. They all created one or two color designs and added them to their kites, all will be flown with pride. Hard work, slow at times, but we all learned plenty, including the teachers. We hope to do another workshop later this winter, perhaps sewing a Della Porta kite.